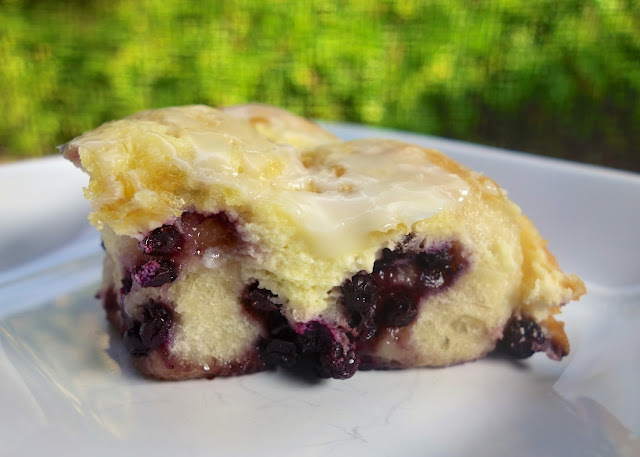 These Blueberry Cheesecake Pull Aparts are SO delicious! How could they not be? Cheesecake, blueberries and bread - YUM! I had a hard time controlling myself around these rolls. We ate these for breakfast and dessert. I think they taste best slightly warm. I reheated leftovers in the microwave for about 7 seconds. Perfect! I used wild blueberries in this dish because I prefer the smaller size. I found the wild blueberries in the freezer section at the grocery store. 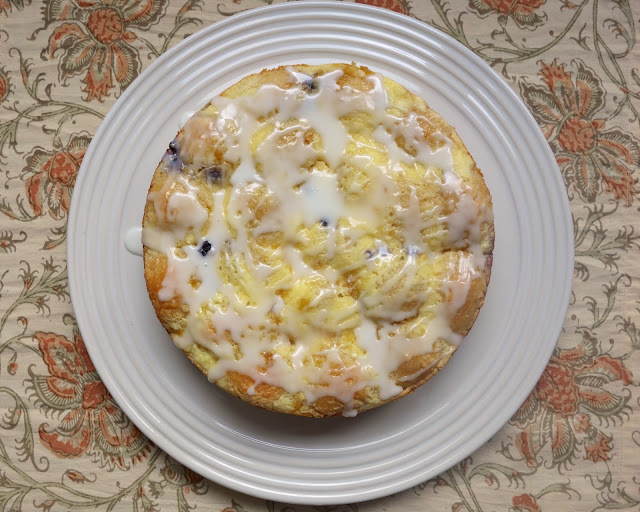 If you can't find them, or don't want to use them, you can use regular blueberries. The rolls will be equally delicious! Thaw rolls, covered, for 30 minutes. Cut rolls in half and place rolls cut-side down in a lightly sprayed 9-inch cake pan. Cover and let rise 30 minutes. Brush rolls with melted butter and sprinkle blueberries over rolls. With a hand-held mixer, mix cream cheese, egg, 2 Tbsp white sugar and 1 Tbsp lemon juice. Spread over rolls. Combine lemon zest, brown sugar and remaining white sugar. Sprinkle over cream cheese mixture. Cover and let rise until double in size. Preheat oven to 350 degrees. Bake for 20 minutes. Remove from oven, cover with foil and bake an additional 7-9 minutes. allow rolls to cool for 15 minutes. Combine powdered sugar and milk. Drizzle over rolls and enjoy! That first shot has me craving one for breakfast. Steph, do you think this will freeze well? Oh dear Lord help me! I've got to lose weight for daughter's wedding...this is killing me!! That first picture is making me too happy for words! How much lemon zest? An entire lemon sounds like a lot but I have never used zest before, thanks!